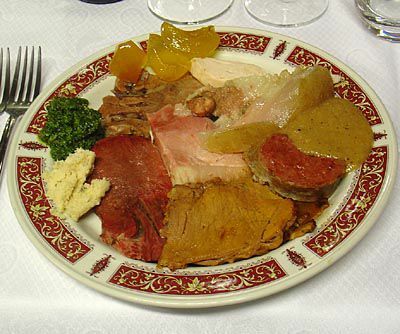 Il Bollito Misto or Italian Boiled Dinner: What's On the Plate? Bollito misto might strike you as one of the simplest and most obvious things there is. And you'd be right, but if it's prepared properly a North Italian boiled dinner is one of the most enjoyable and satisfying meals imaginable, so nice that in the late 1800s Crown Prince Vittorio Emanuele and his friends would sneak off to Moncalvo, a town far from the stifling air of the Court in Torino, to enjoy a rich, flavorful bollito misto: seven kinds of meat, seven vegetables, and seven condiments. The Crown Prince's Bollito Misto was from Piemonte. The boiled dinner pictured here is is instead Veronese, prepared by Pietro, who owns the Ristorante al Calmiere in Piazza San Zeno, and wheels out a spectacular cart for those who order bollito. I asked for seven cuts from the cart (there were more), and sauces too. Boiled beef is quite obvious -- a fairly large piece from an older animal, to judge from its rich flavor. If you boil beef for a bollito misto, bring the water to a boil before adding the meat. As when making broth, you'll want to season the water with a little salt, some parsley, a carrot, onion, a celery stick, and some peppercorns. When the beef is done, the water will work fine as stock, but won't be as flavorful as it is when you make broth by putting the meat into cold water and then heating the water. Cotechino is a gelatinous pork sausage made with a mixture of meat and pork rinds, which provide the texture (and the name, from cotiche). It supposedly was invented by the Modenesi when Pope Giulio II, the warrior Pope, besieged them after they tried to form an alliance with Venice. Considering that Giulio won, cotechino and its cousin, the zampone (a pig's trotter stuffed with the same mixture were the only good things to come of the war for the Modenesi. Now Cotechino is one of the standard foods enjoyed on New year's day, perhaps because it goes very well with the lentils that augur good luck, and is also a requirement in a good bollito misto. Tongue takes a bit of work but is very good, and a perfect foil for the sauces that make a bollito so nice. You should boil the tongue separately from the chicken and beef. Or capon; it's another requirement for a bollito. If you boil it with the beef, the stock will be much richer. When boiling a chicken, some people add a clove (the spice) or two to counter the sweetness that chicken broth can display. Cooked ham is not that common in Italy -- though you will find it as a sandwich meat in deli counters, and it does go onto pizza al prosciutto, I've never encountered a whole ham of the sort people serve at table in the US. Or even slices. But ham is an important part of a bollito misto. As with the tongue, you'll want to boil it separately in seasoned water. This is calf's head, and though I've had it many times in restaurants, I don't think I've ever seen it boiled at home. It's particular, and not everyone likes it -- the texture is frankly gelatinous, and it must be eaten very hot. But it is a perfect foil for really pungent mostarda or cren (see sauces, below). I'm a little hazy on this one, but if memory serves me right, it's boiled horse meat, which is one of the meats Verona is known for. By comparison with beef, it is slightly sweeter and is one item on the bollito cart that many choose to pass over. Pearà, a creamy bread and pepper sauce that's one of Verona's signature condiments. Cren, or ground horseradish. Strong enough to make your eyes water, and very good. Salsa Verde, a zesty sauce made with parsley, vinegar, and other delights. It's also nice with boiled fish or vegetables, especially potatoes. Mostarda, fruit in a rich, sweet syrup that gains considerable zing from mustard oil. It's easy to make and makes for a nice gift. And to accompany the bollito? Tradition dictates a wide variety of vegetables, and Pietro brings a cart with all sorts of things. I settled on erbette, sautéed bitter greens, and cauliflower. They worked quite well with the meats. And to drink? Sparkling water, and since we were in Verona, a Valpolicella Classico Superiore, one of the city's great wines. Very nice.